Home More News TEXTING WHILE DRIVING IS ILLEGAL IN FLORIDA. LEARN MORE TO AVOID DISTRACTED DRIVING. Driver distraction is a rapidly growing problem as the use of handheld communication devices and other technologies continue to advance. 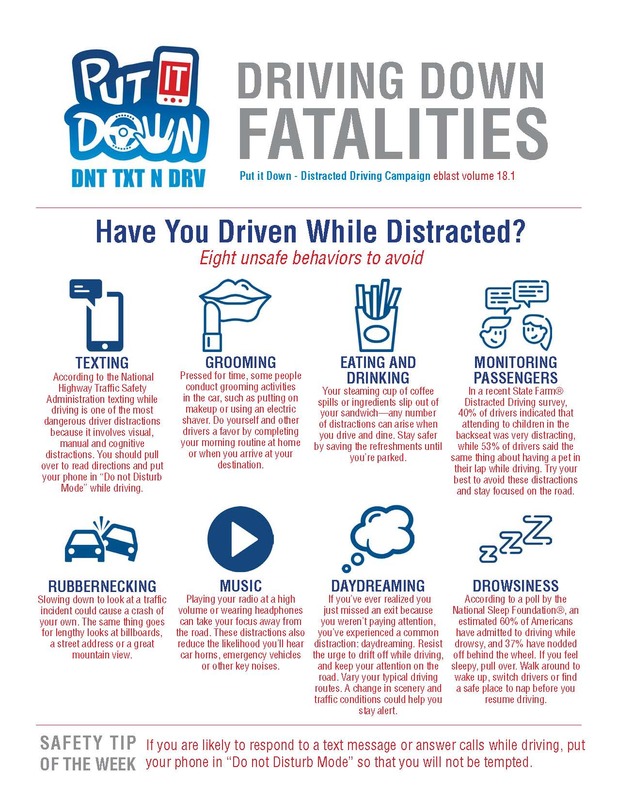 The Florida Department of Transportation is committed to eliminating crashes that are attributable to distracted driving and has developed the Put it Down campaign. Distracted driving includes anything that takes the driver’s attention away from the vital task of driving. There are three types of distraction: manual, which is taking hands off the wheel; visual, or taking eyes off the road; and cognitive, which involves taking one’s mind off driving. Discussions about distracted driving often center on cell phone use and texting but other activities such as eating, talking to passengers, reading, adjusting the radio or climate controls, dealing with children, and being fatigued or drowsy can be equally as distracting. For more information visit http://www.fdot.gov/safety/2A-Programs/Distracted-Driving.shtm.